Cut costs and empower your users with the #1 Adobe® Acrobat® replacement on Windows and Mac. Ideal for personal use to simplify document workflows. To own or to subscribe? We're happy to offer both perpetual and subscription plans for your software. Ownership Customers own the software outright. Customers lease the right to use the software. Free upgrades to new product version. Simple sign-up. No credit card required. The answer to your question is waiting somewhere below. If something remains unclear, please get in touch. What is the validity of the perpetual license? 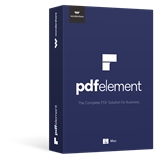 PDFelement comes with a perpetual license which is a 'traditional' model used to purchase the software. You pay for your software license up-front and have the right to use it indefinitely. Plus, we provide product updates free of charge. Do I have to pay upgrade fees for major program release? If you are not enrolled with the software assurance plan, you will have an option to pay for an upgrade fee for future upgrades. The upgrade is a major program release (new version) featuring principal software improvements and new functionality. How do I cancel renewal subscription? Can I try PDFelement for evaluation? Of course! The trial for the personal and professional edition is available to users with limitations to specific premium functionalities. Plus, the trial never expires, this will give you the time to put PDFelement to the test and to see its benefits. How quickly can I expect your support team to reply? We provide response time guarantee between 24-48 hours, depending on the queue. You will receive an e-mail with a link to download the software, as well as the license code for the product. We accept all major credit cards including American Express, Master Card, and Visa. Eligible business clients can also pay with a wire transfer. No! Just give us your basic information – and we're good to go. What languages PDFelement available in? PDFelement supports 9 different languages like English, French, German, Spanish, Portuguese, Italian, Russian, Japanese, and Dutch. What happens if I am not satisfied with my PDFelement? No! There are no legally binding commitments from our side. What is Software Assurance Plan? What are customers saying about PDFelement?